Is it summer yet? It is here in Udaipur or at least the sight of watermelon is a good sign. Watermelon evokes sweet childhood memories of sitting around a round cutting board, mom meticulously and flawlessly slicing the melon while we sat waiting for our slices and contemplating whether the melon was sweet enough or will require a sprinkle of black salt. While sharing meals together is important, fruits like watermelon gives an equal opportunity to bring family together. That is one reason, one tradition so dear to my heart, I'm often reluctant to do much with watermelon. Until, this drink came along last summer in a desperate attempt to use up a less than good watermelon. But before we talk about that, I want to bring to your life (if it doesn't already exist) a rose syrup that has ruled millions of Indian (and Pakistani) hearts since 1907. A classic summer sherbet, 'Rooh Afza' as it is called literally translates into 'one that enhances the spirit and uplifts the soul'. Sweet, deep rose pink with a hint of herbal taste that lingers long after, it is truly the magical thirst quencher of the east. Surprisingly, it was initially developed as a herbal medicine for reducing body heat but soon found itself becoming India's most popular cold drinks. Made of vegetables, fruits, root and flowers- the ingredients make up unique flavor and aromas that truly enchants the soul. Though it is an overly sweet concentrate that has to mixed with water or milk but an occasional lick off the spoon is allowed. A good brand (recommended below) is preservative, fat and cholesterol free. And if that doesn't float your boat, it is absolutely luscious and delicious on guilty pleasures like ice creams, milkshakes, rice pudding, custard and such. In other things, here is my interview with Learn Food Photography. It is an hour long so pull up a chair. The sweet and fresh taste of watermelon is enhanced with the floral flavor of the rose, sharpened by a squeeze of lemon while the mint intensifies the herbal flavor. *Adjust to taste according to the sweetness of watermelon juice and personal preference. Combine watermelon juice, rose squash, lemon juice and black salt in a jar and mix well. Throw in a slice or two of lemon for good measure. In tall glasses, add the ice cubes and pour equal quantity of the squash in each glass. Garnish with mint leaves. Lovely pictures (especially the portrait) and a delightful drink! This looks so lovely... Watermelons are my most delightful fruit one can have in summers ! Beautiful photos! So happy to see a new post form you again! Kulsum, this is worthy of a glossy magazine spread, what gorgeous colors! I just made homemade rose syrup, and now I have another delicious use for it! 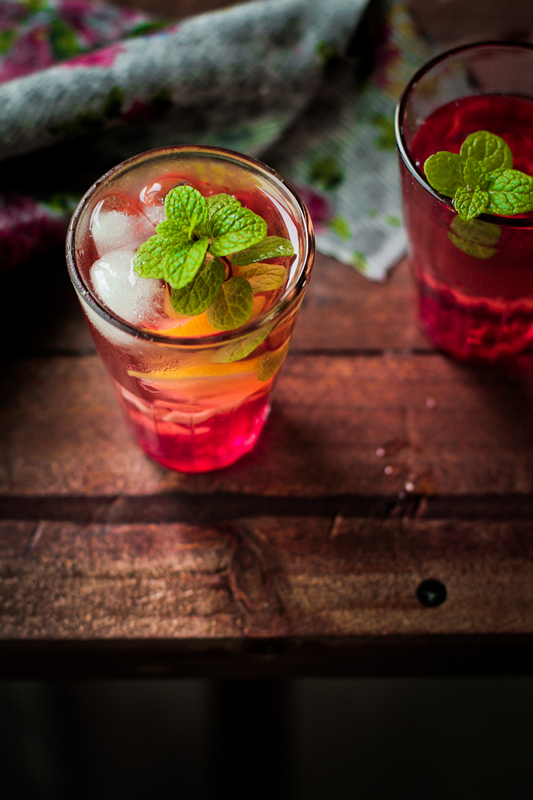 I love rooh - afza and this just sounds so deliciously refreshing for summer! This is sinful... Hamdard Rooh Afza - heard this after such a long time and it almost squeezed out the nostalgic tears from me. The colours play on the senses. Hope you've started to blog regularly now! Trust me, I am actually feeling a lot thirsty after looking at the pictures. and I really want to grab a piece of Watermelon and churn this juice out of it.. Your drink looks fabulous. I love the colors and lusciousness. I bought rose syrup for my Turkish Delights I made awhile back and the smell is divine. Oh my goodness... 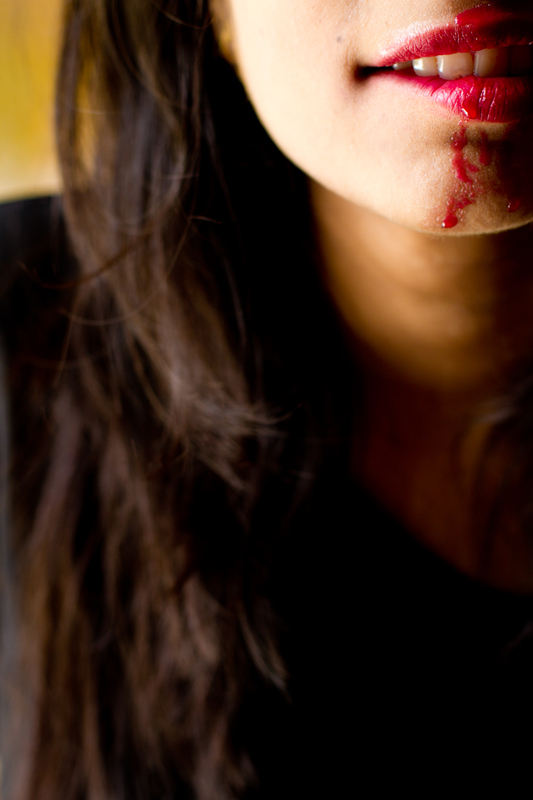 I love that shot of the dribble down your chin. Freakin' fantastic! 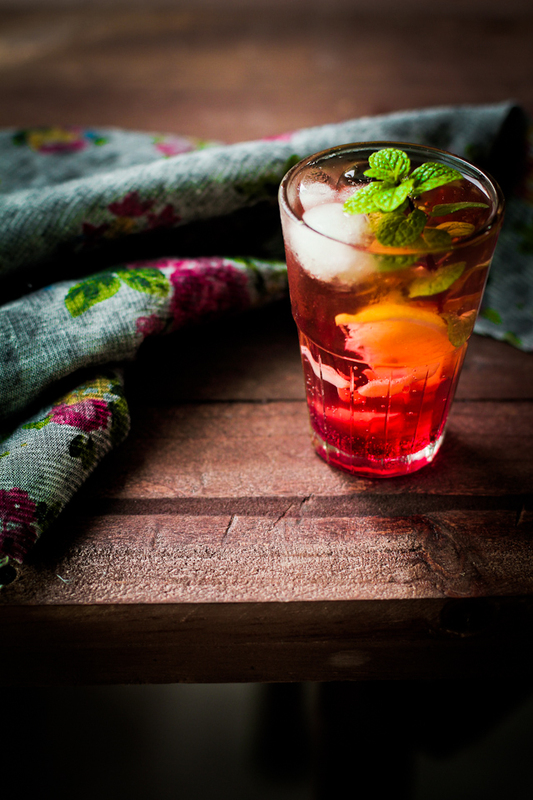 This looks super refreshing and makes me wish for the arrival of summer. Love that portrait shot Kulsum :) I am not a fan of rooh afza drink but Arvind can sip that everyday. I will make this drink for him. He is love it, I know! Is that you Kulsum in the portrait? Nice! I keep checking on your site every now and then hoping for new post, it is always a pleasure to the eye and palate! This sounds really lovely and refreshing for a hot day...and I know the throes of summer's heat will be upon me before I know it so I am bookmarking this! Just gorgeous photography too! LOVE everything about this! drink & that photo of you is AMAZING! What gorgeous colors! Rooh Afza was the only drink allowed in our household growing up as it was "healthy" with no preservatives or fat like you mentioned! A great idea to combine it with watermelon! so very pretty! Hope you are well! It's not watermelon season yet here but I can't wait for it to be! I'm feeling cool just looking at that drink K! This sounds really refreshing and delicious! And the photos are amazing, as always. Also, I'm glad you're back. I just made this for iftaar and it was sooooo good! A perfectly refreshing Ramadan treat! I added tukumaria (basil seeds) to amp up the cooling power. Will be making again soon - for guests! thank you!